This is the show that Ana Paula Cordeiro and I organized. Currently on show at the LES Gallery in The Clemente, 107 Suffolk St, NY, NY 10002. Open daily from 3:30 to 7 PM until January 20th. 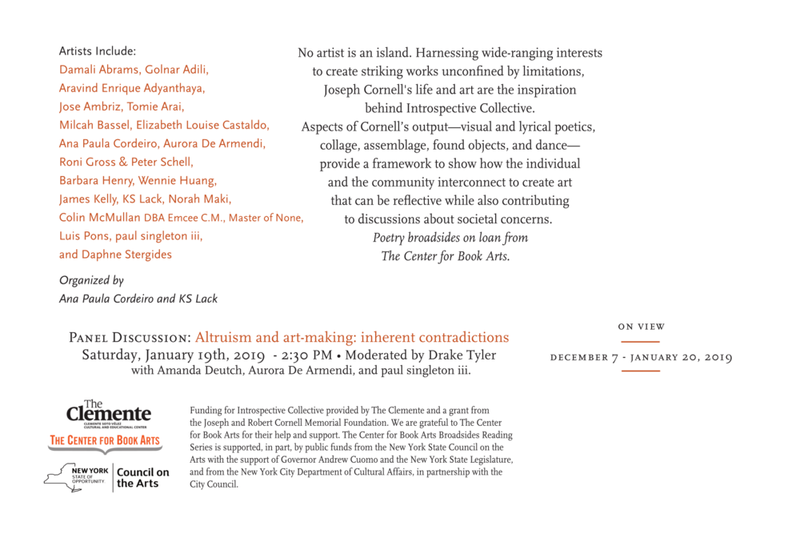 Panel discussion: Altruism and art-making: inherent contradictions, on Saturday, January 19th at 2:30pm. We will be serving coffee and cookies! Here is the back of our promotional postcard. "Sunset" and "Squall" have been selected for an upcoming exhibition LAND AND SEA, a national juried exhibition of landscapes and seascapes. The show will be at Main Street Arts in Clifton Springs, NY, from May 26th to June 29th. Originally inspired by my poem, "When I dream, I dream in color". Usually, the Center for Book Arts broadsides are for poems, but this one was for a short story by David Barclay Moore called "blue". It was an interesting challenge: how do you get the feel of a story when you can only use an excerpt? Anne and I came up with the idea to use words and phrases from the story and lay them all out as a word-cloud. We then ran it through the letterpress a few times to give it density and abstraction, while also referencing the palimpsest effect you get when you have multiple ads and tags plastered up on buildings. The section of that we chose as the excerpt really spoke to both of us. Since the story revolves around two boys in the 1990s learning that they care about one another as more than friends, Anne came up with the idea of adding a polymer plate print of her hand drawing - which, I think, really ties the whole piece together. These were made for my wonderful niece, Hannah B. HB is an avid skier, so we came up with a design to reflect that. The snowflake pattern of the cards was created by using sign symbols from ski slopes - circles, squares, diamonds and double diamonds. Her favorite color is blue, so that is what I used. Five print runs for the invites. Four print runs for the reply cards. Legion bamboo paper. Printed on the Universal I at the NY CBA. Added an artichoke and asparagus to the mix. The two tone color for the beet and the carrot was done by brayer. Emilie and Job of The Farmer's Wife were nice enough to sell these this summer. 8x8 inch flashcard sets. Fronts are individual letters; backs are word clouds. Eight colors; over 800 cards created. Printed on chipboard. A limited number of A-Z sets still available, subscription series of personalized names sold out. This one here was just actioned off at the CBA benefit on April 6, 2018. Comes packaged in a white poplin drawstring bag. A sample of some of the alphabet backs. All of the cards were handset using vintage wood type. The fronts were made at the New York Center for Book Arts. The backs were made at the London Centre for Book Arts. Six-ink run using vintage wood type on Legion Paper. Printed on a Vandercook Universal I Press. Interior pages created by pressure printing various herbs onto somerset book soft white. Covers hot stamped using two tone gold on Colorplan Bitter Chocolate and Pistachio 350gsm. Bound by hand using a seven-hole saddle stitch. Collection of overheard phrases and images designed using vintage wood type punctuation pieces. Printed on the Vandercook Universal I. 2-ply Museum Board. Edition of 50. A limited number still available. Collection of overheard phrases and images. Text printed using vintage metal type. Printed using a Vandercook Universal I. 2-ply Museum Board and Crawford card stock. Edition of 50. A limited number still available. Printed and die cut on the Universal I. Cranford card stock. A word cloud laid out by hand. Using over 30 types of metal type. Printed on the Vandercook No. 4 using a rainbow roll. Poem written by Mara Winokur. Three polymer plates. Three color print. Vandercook Universal I. A chronicle of the Will family tree as river mashup of the Oder (in Pomerania) and the Bitterroot (in Montana). Polymer plates. Two color print run. Hand-drawn details. Printed on the Vandercook SP20 test press. Thank you cards. Three polymer plates - one printed blind using morse code to spell out a hidden message, adding texture to the paper; one plate for the flowers, and one for the stems. Done in the style of Alex Katz. Vandercook No. 4 and 15-21 presses. Pressure print using lemongrass and acrylic blocks. Vandercook 15-21. 4x6 Folded Card printed using wood type punctuation. Two color print. Vandercook No. 4 proof press. Wood type. Accordion fold with added inserts. Double sided coasters for a fab birthday bash. Two color print. Polymer Plates. Printed on the C&P Platen Press; Die cut on the Vandercook Universal I. Wood type. Vandercook Universal III. Lots of fun to make! Wood type on Speckletone paper. Vandercook Universal III press. Business Cards. Linocut and handset type. Printed on scraps. C&P Platen Press.